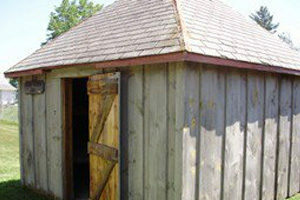 The Farm Equipment Shed is an open air shelter that houses a large selection of historic farm equipment. 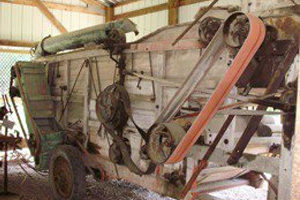 Some of the pieces of equipment that you will find in the Farm Equipment Shed include: tractors, a tree planter, and a variety of other implements. The Glen Flora Jail is located next to the Rail Section House. Stop in and see what life was like for early Rusk County outlaws. Items on display in the Glen Flora Jail include: bunk bed, prisoner uniform, and a sheriff’s desk. 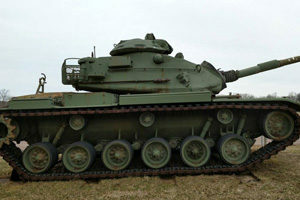 The NATO Tank was donated to the Rusk County Historical Society by Fort McCoy. 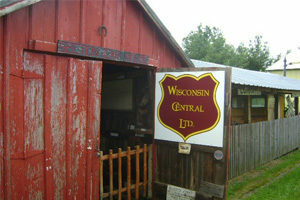 The Rail Section House contains historic railroad equipment from the Soo Line and Wisconsin Central Ltd. Railroads. Some of the items that you will find in the Rail Section House & Rail Shelter include: rail speeder cars, a restored semaphore, signs from depots in Rusk County, railroad safety equipment, lanterns, and much more! Be sure to stop by and take a peek back in time to the “Golden Age” of rail. June and Lavina Martin knew!!!! Fourteen correct guesses of a hat stretcher. Come and Check out the Rusk County Map of Creameries and Cheese Factories in Rusk County!! On display at the Farm and Garden Show Sat March 16th at the Ladysmith High School Gym;!! !